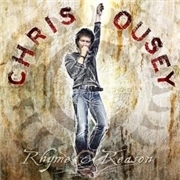 CHRIS OUSEY is the voice sprung from MONROE, Jason Bonham´s band VIRGINIA WOLF, HEARTLAND and his solo work of cause. He did sell a load of albums in the 80´s/90´s but we´re talking about 2011 now. As of late Chris has been busy with 10 releases with HEARTLAND but as time occurred this was a good way of spending it. Spending time with a band consisting of no other than guitarists Mike Slamer (who also produced) and Tommy Denander (ALICE COOPER, RADIO ACTIVE etc. ), classic bass player Neil Murray (WHITESNAKE, GARY MOORE) and drummer Gregg Bisonette of DAVID LEE ROTH and RINGO STARR fame, surely must pay off. And it has. Opener and single cut “Mother of Invention” has an eighties movie score feel. Everything clicks and the result is a blow to most in the genre. The ensuing “Motivation” has a spot on refrain in the YES and HESRT mould. I could go on about just about every track, the exception being the only above average “Any Other Day”, which is a slow mover and rather standardized AOR romp. I must mention the three most outstanding tracks on offer, since they may be the best 2011 has to offer. Both the Move track-like “Give Me Shelter” with its rockier pace and perfectly dosed keyboards courtesy of Tommy Denander and the pulsating “Don´t Wanna Dance” with a winning keys and guitars mix and the chorus and refrain of the smash hit “By Any Other Name”. The instrumental patterns and the vocals really click on these tracks, check them out. The songs are truly handcrafted, at least eleven out of twelve and with such musicians involved, it seems almost ridiculously easy. Aw well, it is November. This one will battle it out with SHY for the melodic gold medal of 2011.